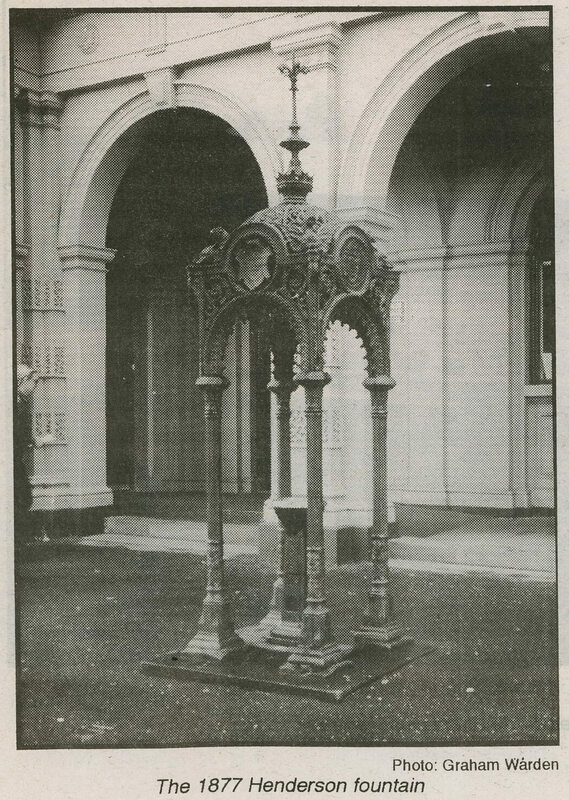 The City of Melbourne has agreed to the restoration of the Henderson cast iron fountain outside the North Melbourne Town Hall, following submissions of the North and West Melbourne Association. Recently, council Officer Mr. Jeff Taylor of Cultural Development Branch convened a meeting concerning the restoration, which was attended by representatives of the Association, Heritage Victoria and Council Officers. Those attending the meeting agreed there are still some matters to be worked out before final decisions can be made, funding applied for and work commenced. Should the fountain be reconstructed completely? This would include the restoration of the inner pedestal, and drinking fountain and decoration. What is the best way to provide a drinking function to the fountain, since the nineteenth century method of drinking from bronze cups hanging on chains from the structure is obviously unhygienic? Will the fountain be readily accessible if all or any of the original railing and steps are reconstructed? Will there be room for any railing or steps where the fountain stands on the footpath in front of- the Post Office? Should the fountain stay outside the Post Office or be moved? If moved, to where? Council Officers are considering possible answers to such questions. The North and West Melbourne Association is continuing to gather relevant information. Bathurst in NSW has a similar drinking fountain and canopy, as does Hay and, overseas, the Royal Museum of Scotland in Edinburgh. Photographs and information are being sought of those intact fountains. Photos have been collected of other similar fountains, but with some of the top parts of the fountain missing, in Williamstown, in Port Adelaide and in several locations in Sydney. Information and advice is also being obtained from metallurgists on technical aspects such as repairing, casting, quality verification and appropriate maintenance. Heritage advice, including reference to the Burra Charter, is also being obtained. North Melbourne News will keep you informed on the progress of this cooperative venture between Council, the Association and other interested bodies.